There will never be peace in the Middle East until the Palestinians change, and adopt the values of human rights, religious freedom and liberal democracy. In the absence of that, Israel addressing their supposed grievances (ending the "occupation", allowing a "right to return") will lead to more violence, not less (as the "Peace Process Intifada" has shown). The only thing that will bring long-term peace is the gradual adoption of democracy and human rights by the Palestinians. 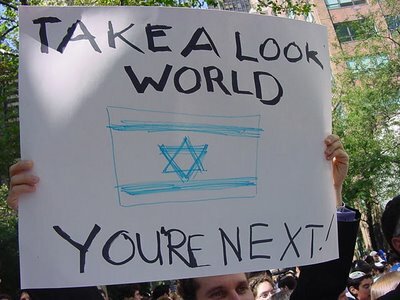 From pro-Israel demo, June 2007. Israel is the front-line state of the West, facing the enemy before we have to. In the 2000s, we discovered to our surprise that the disgusting suicide bombings we saw in Israel in the 1990s were not just Israel's problem. They were a glimpse of our future, in the rest of the West. They show what the future will be like, in Madrid, London and all western cities, which will have to live now for the next few decades under the constant threat of jihadi suicide bombing. Israel's fight is our fight - the fight to preserve democracy, freedom of religion, free speech and human rights against our totalitarian enemies. Note how the killing by Palestinians massively escalates after Israel tries to do a deal with them. Unlike in Northern Ireland - where the peace process led to a vast reduction in deaths - here, the peace process has made the conflict far worse. To reduce deaths, it seems unavoidable that Israel should abandon the peace process and give war a chance again. Until the Palestinians change, it seems there is nothing else the Israelis can do. The Clinton "Peace Process" started in 1993. A terrorist state was set up on the West Bank. A terrorist state was set up in Gaza. Violence against Israel massively increased. The Second Intifada started in 2000. 4,000 people died because Israel tried to make peace with Arafat. It was a terrible strategic and moral error by Israel. Bush Destroyed a Dictator. Clinton Installed One. Which of our last two presidents made the world safer? - Ruth R. Wisse, 15 Jan 2009, casts a cold eye on the 1990s Clinton "Peace Process", which vastly increased terrorism and oppression. "Mr. Bush removed the most ruthless dictator of his day, Saddam Hussein, thereby offering Iraqi citizens the possibility of self-rule. Bill Clinton's analogous achievement in the Middle East was to help install Yasser Arafat, the greatest terrorist of his day, as head of a proto-Palestinian state. ... This so-called peace agreement rewarded terrorist methods as fail-safe instruments of modern warfare, and accelerated terrorist attacks on other democratic countries. Though Mr. Clinton did not foresee these consequences ... To be fair, Israel's role in this self-deception was, if anything, even greater. The Oslo Accords made Israel the first country in history ever to arm its enemy with the expectation of gaining security. ... The Oslo "peace accord" made the world more dangerous and subjected Palestinian Arabs to a rule of violence, corruption and intimidation.". "The Intifada was caused by Sharon"
To explain Arafat's disgusting betrayal of the Peace Process, the left invented a bizarre theory that the Second Intifada was actually caused by Ariel Sharon. Angry at Sharon's visit to the Temple Mount, the proud Palestinians apparently had "no choice" but to start suicide bombing women and children in buses and cafes. I'm not sure if this theory actually shows the Palestinians in a good light, but that's the left for you. The BBC as at 2013 is still promoting the idea that the Sharon visit was the cause of the intifada. Of course in reality the intifada was planned in advance. "Arafat was trying to stop terror attacks"
Another mad theory of the left was that the appalling terror attacks in the Second Intifada were by some unexplained groups, and Arafat was trying to stop them. Of course in reality, Arafat was behind the terror attacks. Palestinian Ambassador to Libya, Sept 2013, explains that most of the terror attacks in the Intifada were carried out by the PA.
Arab/Palestinian terror killings in Israel, 1948-2011. First there is the Arab slaughter of the Jews in 1948. Then Israel gets control of its territory, and things calm down until the emergence in 1968 of international Palestinian terror. By the 1980s, Israel has largely defeated / protected itself from global Palestinian terror. But then it makes the terrible, fateful decision to start a "peace process". The 1993 Clinton "peace process" destroys the peace that Israel had enjoyed in the 1980s. Israel brings back Arafat from exile and gives him money, weapons and a terrorist state to run. Violence against Israel escalates to heights not seen since 1948. Israel eventually learns how to defeat the intifada, using military means and the life-saving wall. Violence finally returns to pre-peace process levels. The tragedy of the "peace process". No one imagines that things could get worse. Just like revolutions should make a country better, not worse, so a "peace process" should lead to less violence, not more. Arafat shows that the "peace process" was always a fraud. The Israelis were sincere. He was not. Here on PATV in 1995, he compares the Oslo Accords to the Treaty of Hudaybiya, that Muhammad signed with the intention of breaking it later, after his army had become stronger and he was able to win a war. Westerners weren't listening. And still aren't listening. Note also the "secular" Arafat talking like a religious maniac here: "How can we accept such humiliation of our religion, Oh, Messenger of Allah?" The GDP per capita of the West Bank and Gaza over the last few decades. Note above how the Palestinians were prospering under Israeli "occupation", with a growing economy linked to Israel and Israeli settlements. GDP per capita was, in 1990 dollars, $ 1,790 in 1967, and $ 5,312 in 1999. That is, the Israeli occupation made the "oppressed" Palestinians 3 times richer. There was also a massive rise in Palestinian life expectancy from 54 to 73 under Israeli "occupation". The wages of war: Gaza per capita income in 2010 is only 60 percent of what it was in 1994. Anonymous blog by "M.S." in The Economist gets it wrong about why Palestinians are poor, 31 July 2012. Or via here. M.S. says: "Per capita income in Israel is over $31,000; in the Palestinian territories it is closer to $1,500. Those aren't the kinds of numbers that divide industrious Protestants from happy-go-lucky Catholics. ... You don't get those kinds of divisions because of cultural differences. The reason most Palestinians have low third-world income levels is that they are born into impoverished towns or refugee camps inside the gerrymandered Bantustans of the Palestinian Authority, where border crossings are controlled by Israeli military authorities ..." [Etc. It's all Israel's fault] "... But without the occupation they might have been as wealthy as, say, Jordanians, who have a per capita income (purchasing-power-adjusted) of $6,000." But this is nonsense. We can see clearly above that without the intifada they would have a GDP of $6,000. They were doing well under "occupation" before the intifada. (Or at least as well as other Arabs.) It was their choice to wreck it with Arafat's useless intifada. And M.S. never explains why Israel is at $31,000 and Jordan is at $6,000! He treats that as normal. But what on earth is that about if not superior "culture"? In fairness, his main motivation is probably just to attack Romney to boost his man Obama, so no wonder he didn't do the research. If Obama had said it (and he pretty much did) this author would be defending it. International aid to Palestinians - billions and billions down a black hole - funding war, hatred and Swiss bank accounts. Study of aid to Palestine, reported Nov 2012, finds Palestinians have received more aid than almost anyone in history, and it has all been wasted. "since the signing of the Oslo Accords in 1995, the Palestinian Authority has been the recipient of 25 times more financial aid per capita (considering current inflation) than the citizens of Europe received under the Marshall Plan following World War II." "For those who know their history, the Marshall Plan financially enabled Europe to successfully rebuild following the most devastating war in history. And yet, having been handed 25 times more cash and resources than post-war Europe, the Palestinian Authority continues to complain of unemployment, a faltering economy and destitute living conditions." ""Poverty in the Palestinian areas could have been eradicated years ago," wrote JIJ founder and director Calev Myers on his Facebook page. "The Palestinian people should be outraged by this. So should Americans and Europeans."" The left wants Palestinians to be poor. If the Palestinians decided to ignore jihad, and worked to become prosperous and peaceful, they would no longer serve any psychological function for the left. The Guardian and the left loves poor and desperate foreigners who blame their ills on the white man. They have little interest in poor but peaceful foreigners who work hard to improve their lot. Palestinian leaders want Palestinians to be poor. If the people lost interest in jihad and became interested in prosperity, these leaders would lose all their power. The Peace Process installed precisely those Palestinian leaders who will keep the Palestinians poor and desperate, and removed older leaders who had made the Palestinians richer. The western left, and their own leaders, are enemies of the Palestinian people. I need to do a later version of the above graph, which would show that the end of the intifada, and the building of the wall, has helped Palestinian prosperity. The pathetic "stabbing intifada" that started in Sept 2015 threatens to end all the gains for the Palestinian economy. The stabbing intifada caused an immediate and rapid decline in tourism, business, hotel and restaurant revenue. Jihad causes poverty: Report, Jan 2016, says the stabbing intifada has cost the Palestinian economy $1.2 billion so far. That is 10% of the size of the annual economy, lost in just 3 months. This is after 161 attacks on Jews. So each attack on the Jews cost the Palestinians over $7 million. I hope it was worth it, you racists! 35 percent of Arab businesses in Jerusalem's Old City closed down in 2015-2016, because of the stabbing intifada. Well done, western leftist morons, for encouraging this. Irish idiot baffled by existence of checkpoints, Mar 2016, after 320 terrorist attacks on Jews since 2015. You would think she would show the slightest curiosity about why they are there. What I think Palestinians should do: "Palestinians should pursue getting rich. Not land, blood, honour." So Palestinians should just "get over it" and move on? At least, if they want to be happy. If they want to wallow in misery, they should carry on what they are doing. The left are the enemies of the Palestinians because they encourage them to keep fighting instead of starting a better life. As I say to some other lefties in July 2014: "Both of you want Gazans to wallow in misery and vengeance rather than build a better life. Not progressive!" 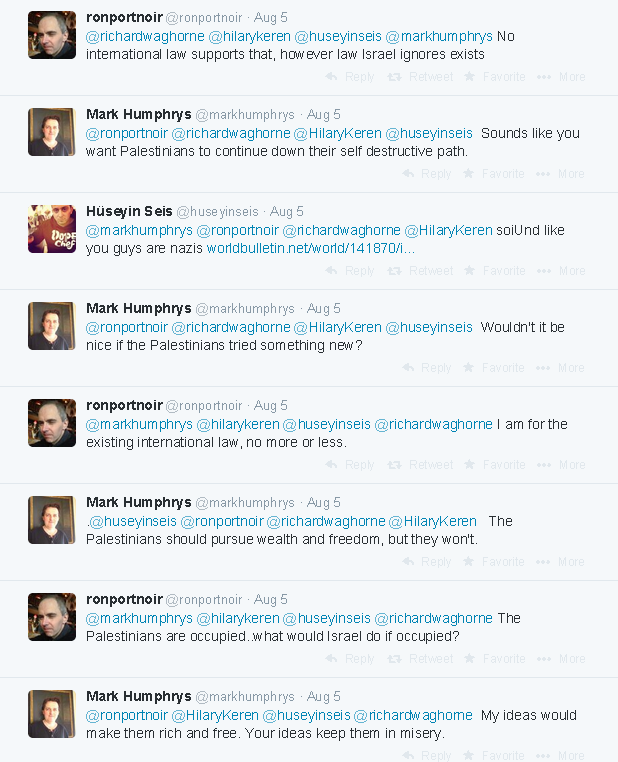 I argue that the left for 50 years has encouraged Palestinians to ruin their lives. More debate in Nov 2014. I say that "Palestinians should pursue prosperity, peace, shopping, freedom - not jihad, revenge, honour, "soul"." 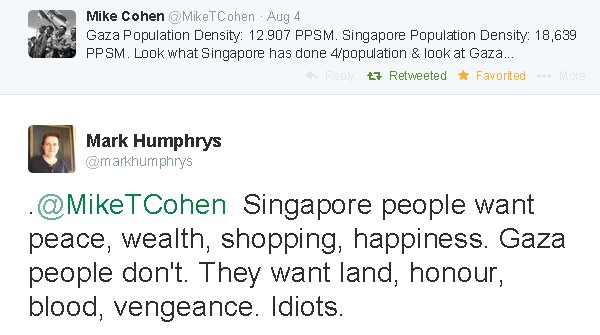 We can argue about the details, but broadly speaking Singapore is rich and peaceful because it wants to be. Gaza and many other places in the world don't want to be rich and peaceful. They want other things. As I say: Why didn't Gazans try setting up a liberal democracy? Israel would have poured money into it. The intifada is over, and the left was wrong. All through 2000, 2001, 2002 and 2003, as the Palestinian intifada raged against Jewish civilians, we heard again and again from the western left that Israel's response was all wrong. That a tough Israeli response would just encourage more hatred and violence, and breed more terrorists. That Sharon was a disaster. But the left was wrong. Israel's response - military incursions, building the wall, and targeted assassination - ended the violence. Israel elected Sharon to stop the Palestinian violence - and he did. The western left was wrong about everything. Israel attacking its enemies has made them weaker, not stronger. The Fear Factor by Bret Stephens - "In 2003, the number of Israeli terrorist fatalities declined by more than 50% from the previous year, to 213 from 451. The overall number of attacks also declined, to 3823 in 2003 from 5301 in 2002, a drop of 30%." Why is this? How on earth could Israel attacking its enemies have made them weaker? As Barry Rubin says, "it is strange to read everywhere in the West that Israel's policies, including the killing of Hamas leaders, have failed. Since figures show that the number of Israeli casualties in 2003 were half those in 2002 and that those so far in 2004 .. are half those in 2003, everyone should be discussing the success of Israel's counterterrorism effort. But, unfortunately, we live in an age where political agendas often determine the analysis of events rather than the other way around." The failure of Arafat's intifada by Charles Krauthammer, June 21, 2004 - "While no one was looking, something historic has happened in the Middle East. The Palestinian intifada is over, and the Palestinians have lost. ... The overall level of violence has been reduced by more than 70 percent. How did Israel do it? By ignoring its critics and launching a two-pronged campaign of self-defense." Attacking your enemy may not make him stronger. It may make him weaker. Further big drop in terror in 2004 - "In 2004 .. 117 Israeli civilians and soldiers and a handful of foreigners were killed and 589 were wounded in Palestinian terror attacks. That compares with 214 killed and 1,004 wounded in 2003 ... The ISA credited the controversial security fence as a key tool in thwarting terror attacks." Israel's unexpected victory over terrorism by Yossi Klein Halevi and Michael B. Oren, Sept 20, 2004 - Much to everyone's surprise (including the Israelis), it turned out that a military solution was the answer to the Palestinian intifada. Against howls of protest around the world, Sharon implemented a military solution. And it worked. The intifada stopped. And, oddly enough, the world has stopped complaining. 2009 was first year in decade without suicide attacks. Suicide attacks in 2001: 35. Suicide attacks in 2002: 53. Suicide attacks in 2009: 0. Some people believe that if Israel ends the occupation of the West Bank, and ethnically cleanses all the Jews there, then finally there will be peace, and the Palestinians and Arabs and Iranians will finally stop trying to destroy it. But it is as clear as it could possibly be (short of actually doing the experiment) that this will not happen. Withdrawing from the West Bank will simply make the enemy stronger, and the war will carry on. People who claim the 1967 borders will bring "peace" are utterly unable to explain why there was no peace before 1967. This war is not about the 1967 occupations. It has been going on since 1947. This war is about the existence of a dhimmi state. Israel withdrew from Lebanon in 2000. Yet it was still attacked from Lebanon. Why? Israel withdrew from Gaza in 2005. Yet it was still attacked from Gaza. Why? Given this record, it is clear that Israel withdrawing from the West Bank will not bring peace. So it might as well keep some of the West Bank, and any other territory it thinks it needs as a buffer zone. This is not a solution. I am saying that nothing Israel does can bring a solution. It just needs to hunker down and wait for the Palestinians (and the Islamic world) to change. "Dear Palestinian Arab brethren: The war with Israel is over. You have lost. Surrender and negotiate to secure a future for your children." "you and your leaders have wasted three generations trying to fight for Palestine, but the truth is the Palestine you could have had in 1948 is much bigger than the one you could have had in 1967, which in turn is much bigger than what you may have to settle for now or in another 10 years. ... At the moment, brothers, you would be lucky to secure a semblance of a state in that Gaza Strip into which you have all crowded, and a small part of the West Bank of the Jordan. It isn't going to get better." "You fire ridiculously inept Kassam rockets that cause little destruction and delude yourselves into thinking this is a war of liberation. Your government, your social institutions, your schools, and your economy are all in ruins. Your young people are growing up illiterate, ill, and bent on rites of death and suicide, while you, in effect, are living on the kindness of foreigners, including America and the United Nations." "The war is over. Why not let a new future begin?" Victor Davis Hanson nails the solution to the Palestinians' problems: "I was in Palestine 2 years ago, and nothing I saw on the West Bank changed my previous opinion nor the Palestinians I talked to: had they simply ignored Israelis, crafted a civil democratic society and engaged in nonviolent peaceful protest, they would have their state and the world's support." The Israelis, like normal westerners who live in a society of constant criticism, tend to blame themselves, and think logically and ask what they can do to solve it (give money to the Palestinians, withdraw from Gaza). They are in danger of not realising there is nothing they can do to solve it. The Palestinians, like normal members of a traditional honour-shame culture, tend to blame others. There is no room in their society's discourse for people who suggest the Palestinians may have to change. Their society is largely uninterested in compromise and debate. They do not really want to build a modern, free and rich Palestinian country, or they would have done so long ago. Rather, they are driven by honour, shame, pride and revenge. And Palestine can fall into ruins and poverty and chaos for all they care - so long as honour is avenged. In summary, the conflict will never end until the Palestinians change their entire culture. Why the Arab World Is Lost in an Emotional Nakba, and How We Keep It There. Richard Landes, June 24, 2014, says that only an understanding of honour-shame culture explains why Israeli concessions have led to more, not less, aggression. "The policy implications here are grave. The �rational� model assumes that the �67 borders (�49 armistice lines) are the key and that an Israeli withdrawal will satisfy rational Palestinian demands, resolving the conflict. Attention to honor-shame culture, however, suggests that such a retreat would trigger greater aggression in the drive for true Palestinian honor, which means �all of Palestine, from the river to the sea.� Recently, military historian Andrew Bacevich, expressing the logic of win-win conflict resolution, wrote that only by leveling the playing field between Israelis and Palestinians, by weakening the too-dominant Israelis, could negotiations really work. By ignoring �strong-horse� Arab political culture and its deep grievance with the �Zionist entity,� he never even raises the possibility that parity would produce more conflict". Danny Ayalon explains how the occupation is not the cause of the conflict. Ending the occupation will not bring peace. Excellent video explains why the 1967 borders would threaten Israel's very existence. Dan Hodges explains the basic problem. Doing what the Palestinians want will bring more, not less war. The threat to Israel is now - as it always has been since 1947 - that of a Second Holocaust, the extermination of the 6 million Jews of Israel. Israel's national priority is now, and always will be - until the Islamic world changes - to guard against this nightmare. Is there any more optimistic note I could end on? Not really. It is the Palestinians that must change if there is ever to be peace. The Palestinians must abandon Islamism, jihad, sharia, tribalism, autocracy and anti-semitism and adopt the values of liberal democracy, freedom of speech, freedom of religion and human rights. If they ever do so, with Israel next door, there will be peace and prosperity beyond their dreams. In one way, the solution is easy because all that is needed is for the Palestinians to change. In another way, the solution is impossible because what is needed is for the Palestinians to change. In general, there will be no peace in the Middle East until the entire Islamic mind changes, and embraces the Enlightenment and the modern world. This will take many decades, maybe a century, but it could eventually happen. In the meantime, while we wait for the Palestinians to change, it seems that a security solution is the only way forward for Israel. Peace? No chance by Benny Morris, 21 February 2002, argues that nothing can be done with the current generation of Palestinians. Natan Sharansky, 23 Nov 2007, on the pointlessness of the 2007 Annapolis peace talks, because nothing has changed in Palestinian society: "Annapolis is doomed to failure not because we or the Palestinians have not made enough concessions - it is doomed to failure because it is built on distorted reasoning to the effect that it is possible to move ahead and make a deal with some leader and totally ignore what is really happening in Palestinian society." Telling the Truth about the Palestinians, Khaled Abu Toameh, April 27, 2004. He says there is no free speech under Arafat and "Palestinian journalists .. were freer to write what they wanted under Israeli occupation before the PLO returned from exile." Palestinians: The Message Remains No and No, Khaled Abu Toameh, November 16, 2016. A roundup of the Palestinians' eternal refusal to compromise with Israel. They refused to compromise under Arafat. They refuse to compromise under Abbas. For Arafat, Abbas and all Palestinian leaders, a "solution" means the Palestinians get 100% of what they want, with no compromise ever. This is why there cannot be a solution. Islam needs to become less confident. The only hope for the 1,400 year jihad to ever end. Optimism for the long-term future of Islam. Dennis Prager points out that the conflict is incredibly easy to explain (the Palestinians do not want a state but want to destroy Israel) but impossible to solve (the Palestinians do not want a state but want to destroy Israel). "European spectators must understand the real force that drives [the Israel-Palestine conflict]. It is not "Palestinian land" as such. Otherwise Israel�s past concessions of land, such as � at Oslo � leaving 96% of West Bank Arab Palestinians to govern themselves or evacuating Gaza in 2005, would have been taken as goodwill gestures, stimuli to further negotiation and peace-making. Instead, they were taken as signs of weakness, cause for more violence. The real engine of conflict is the Islamic imperative laying down that any land once ruled by Islam � as historic Palestine was ruled by the Turkish caliphate � must be returned to Islam, though it take 1,000 years. Only this can explain uncompromising calls for Israel�s elimination." - The only time (the only time!) 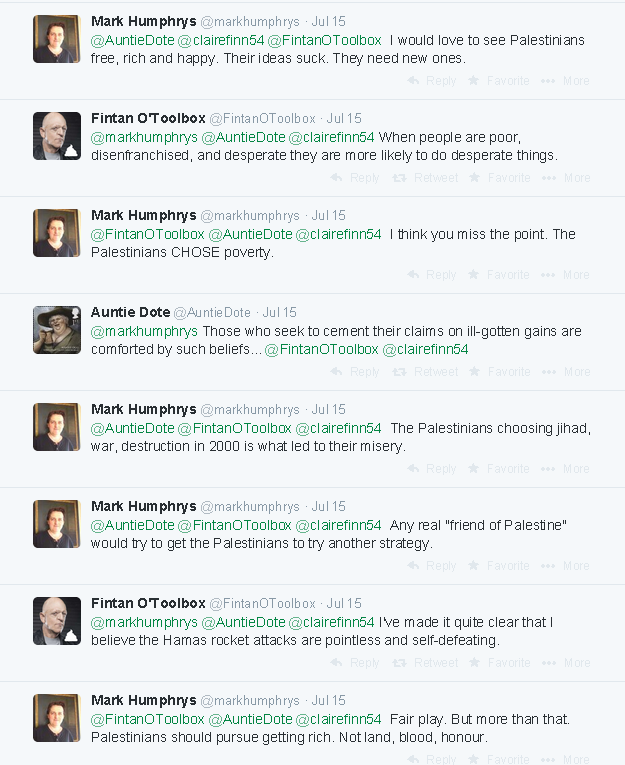 I can recall seeing the cause of the Israel-Palestine conflict laid out in an Irish newspaper. I cannot recall any Irish journalist ever doing this. 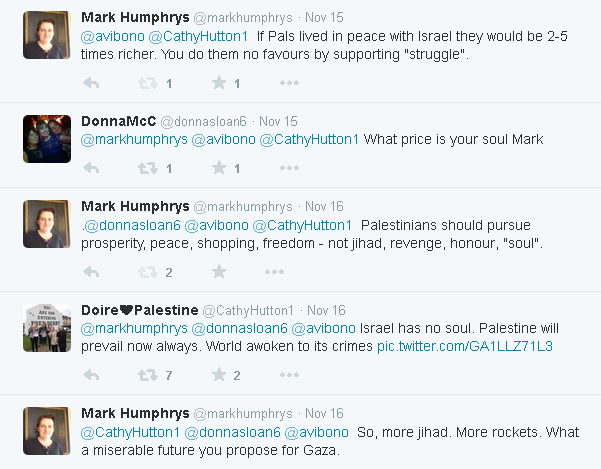 It took the Israeli ambassador, 12 Dec 2012, to explain this to Ireland. "War with Israel is not subject to a treaty, cease fire, Sykes-Picot Treaty agreements, patriotism or disputed borders, but it is jihad for the Cause of Allah until the entire religion is for Him only. Jihad seeks the liberation of Palestine, the entire country of Palestine and to liberate every land that used to be a territory of Islam, from Spain to Iraq." - Al Qaeda also explained it in 2006, but the Irish left didn't listen. "Kosovo is a success because we wanted a change. We are not like Iraqis or Palestinians who don't want change and seem to enjoy living in poverty. Here everyone is thinking about progress and the future."